A three year starter and two-time All-American guard at Penn State, Wisniewski played in 3 Bowl games and on the ’86 National Championship Fiesta Bowl team. 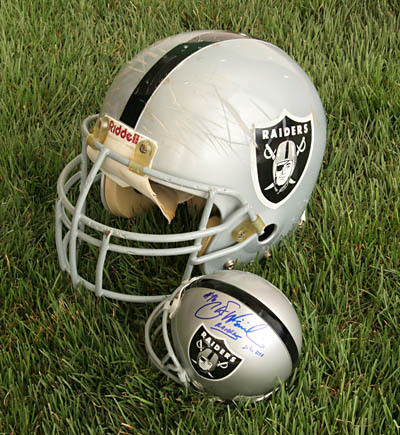 Drafted in 1989 by the Oakland he spent 13 seasons in the NFL all with the Raiders. Born in Rutland, VT but raised in Houston, TX the 6’4″, 300-lb. lineman missed only one game in the pros. A vicious competitor, Wisniewski earned a reputation as never letting up on any play. This type of intensity led him to being named to the NFL All-Rookie team and to 8 Pro Bowls, tied for most in Raider history. A devout Christian Wisniewski became a licensed minister after his playing days. Some NFL players find it difficult to separate the often brutal and violent game of football with their personal lives. Steve Wisniewski never has. The eight-time All-Pro selection always found strength and comfort in his family and faith. It is the backbone of his life and the motivation that produces a positive outlook on his day-to-day activities. Born in Rutland, Vermont, Wisniewski and his family moved to Houston, a place he prefers to call home. It is in Houston where he attended high school (Westfield High) and where he met his wife, Jeanne. They have three children, Cole, Kelly, and Courtney. 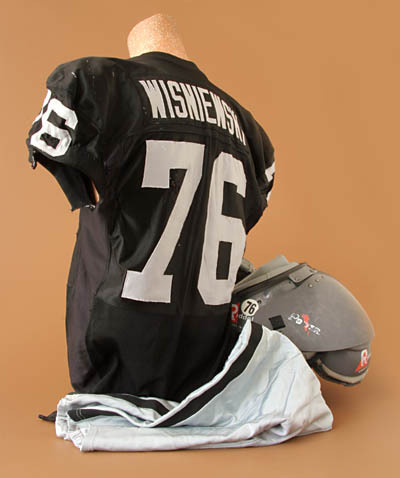 For 13 seasons Wisniewski played offensive line in the NFL, all in Oakland for Raiders owner, Al Davis. He never missed a game and doesn’t miss the game since retiring in 2002. On every play he played the game as hard as he could, never letting up. 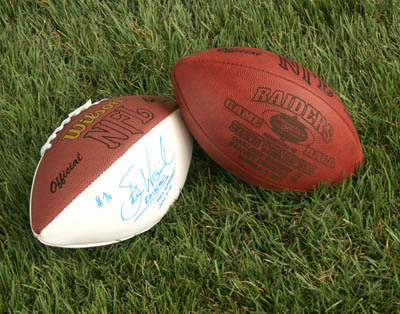 He nearly retired after the ’01 season but came back for one more upon the urging of Coach John Gruden and Al Davis. He had the reputation as a dirty player, perhaps unfairly so, but never was kicked out of a game. In ’95 he was fined $65,000 by the league for his overly aggressive play. I was known for giving the extra effort. I was doing my best to bust you up. There were never any grudges. No one I hit needed to be carted off the field. 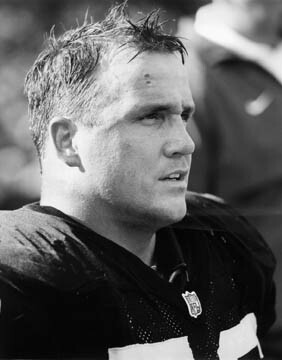 Linebacker Richard Harvey played with the New Orleans Saints in ’96 and got into a few scuffles with Wisniewski. When Harvey played with Oakland the following season one of the first things on his agenda was to seek out his former adversary and shake his hand. Wisniewski was the type of player you didn’t want to go up against but as a teammate he was a players’ player. Though he never played in the Super Bowl, Wisniewski did play in two NCAA championship games with Penn State. In ’85, Penn State lost to Oklahoma and, in the following season, Penn State defeated Miami, Florida, in the Fiesta Bowl for the title. Wisniewski received a bachelor’s degree in marketing. But it is his faith and a spiritual way of life Wisniewski promotes and adheres to. Raised in a Catholic family, Wisniewski continued his study and fascination in the bible throughout high school and college. He is a licensed minister and has assisted former Raider Napoleon Kaufman at The Well, a non-denomination church in Danville, California, where the Wisniewski family resides. Wisniewski has not turned his back on football. He stills goes to some Raiders’ games and continues to talk to players on the team. A number of the current Raiders attend The Well. Being selected to The Polish-American Sports Hall of Fame deeply touched Wisniewski. Never one to look for accolades, this recognition is something he’ll cherish forever.